I have to report that the theme is a novelty and wears off quite quickly once inside for over ten to twenty minutes. The food itself is average, not very good but not very bad either. We went for afternoon tea at 3:30 and ordered a tiramisu, a cheesecake, a mascarpone filled chocolate cake and a chocolate raspberry mouse on top of a green tea crust. I would suggest making reservations in advance if you would like to check the place out – we tried the day before and took the only available spot which was the next day. The place is under a five minute walk from the Zhongxiao Fuxing MRT station – take the 5th exit, go straight and turn right at the first cross street. 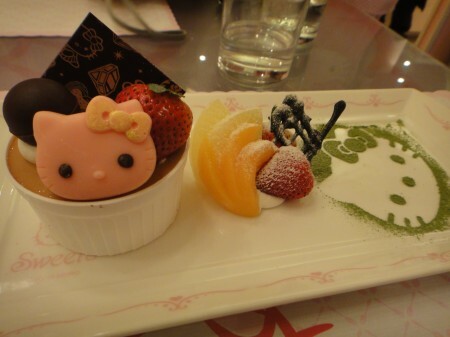 Tags: Afternoon Tea, Cheesecake, Chocolate, Dessert, Green Tea, Hello Kitty, Lunch, Mascarpone, Mousse, Peach, Raspberry, SoGo, Sprite, Sweets, Taipei, Taiwan, Tiramisu, Zhongxiao Fuxing.